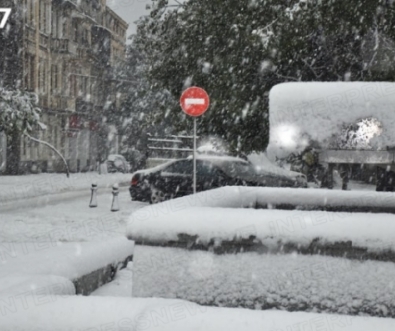 TBILISI, DFWatch–Ten days after snow fell in the eastern Adjara region of Georgia, frustration is growing as there are still problems with supply of electricity, natural gas and water. December 13, people demonstrated in Batumi against what they feel is a lack of attention from the government. People brought 1990’s accessories to Rose Square near Batumi City Hall and called on the regional authorities to pay more attention to the infrastructure problems caused by the harsh winter. “On December 7, electricity was cut, outdoor lighting was off and roads were covered with snow. No-one has cleaned it up. On the 13., they turned off th enatural gas and the water too. I had to close my restaurant and other restaurants and facilities stopped working,” Demetre Ergemlidze told us. He is the manager of a restaurant in Batumi. “9 electricity poles are damaged. Our crews are working 24 hours a day. Supply of electricity will be restored soon,” Energy Minister Kakha Kaladze promised on Monday. Yesterday, there was still only supply of gas, electricity and water for set periods during the day. “It felt like the 90’s,” Demetre says. In the 1990’s, all of Georgia had a deficit of water and electricity. The streets were dark and people were without heating and natural gas. Meanwhile, work continues to restore supply.